The Vietnamese bracelet’s hidden hinge can serve as a generic model for jewelry. 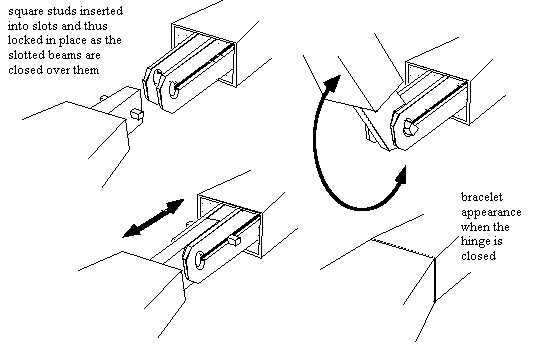 It should be noted that as with many fine mechanics one designs the piece first without regard as to how it will function and then one deals with the actual solution for the specific problem, so that every complex hinge and most fine catches differ in their details depending upon the actual piece itself. On fine jewelry every mechanic can be different a specific to the piece. This is why looking at models is so useful. You never know where an idea you saw somewhere will provide a solution to a technical and design problem you have. The bracelet had a box catch on one side and on the opposite side where one expected to see the tubing ends of a hinge in only a single line or crack was visible. To use it one opened the catch, pulled slightly on the bracelet so that the hinge part slid out to the point that it could rotate, then it rotates open to allow one to insert the wrist and close it again. 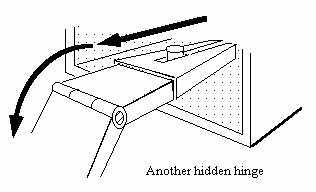 Hidden hinges need to bend out of the way and usually withdraw into the body of the piece. They often involve the use of slides or double hinging in some manner. This one is constructed with a piece of thick sheet on one side. Through the end of the thick sheet is soldered a square hinge pin. On the other side are two pieces of strong sheet. They have slots in them and end in a round hole. When assembled the square hinge pin just fits in the slots and slides in and out of the body of the bracelet. When the square hinge pin reaches the round hole it can now rotate and so the hinge operates to swing the bracelet open. 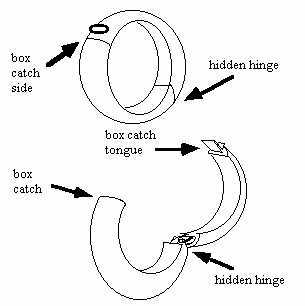 To close it one closes the bracelet and engages the box catch while at the same time the hinge slides back out of sight into the bracelet.